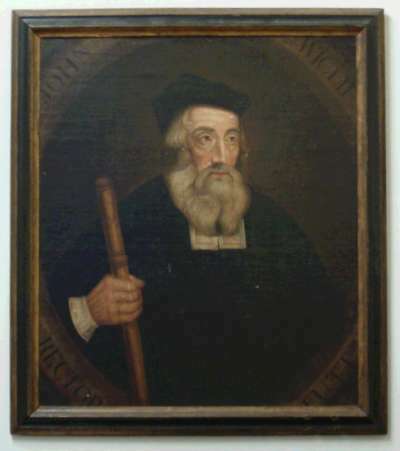 John Wycliffe (also Wycliff or Wyclif), born c. 1330, was born in Yorkshire and educated at Oxford University. Fellow of Merton College in 1356 and Master of Balliol College circa 1360-1, he served a rector of Fillingham and later of Ludgershall and of Lutterworth (the latter two until his death in 1384). He was in the service of the Edward, the Black Prince of Wales, and of Edward’s brother, John of Gaunt, the Duke of Lancaster, from 1371, serving as an envoy and propagandist. Wycliffe made his reputation early as a philosopher. Reacting against the prevailing scepticism of Oxford thought, which divorced natural and supernatural knowledge, he returned to the philosophical realism of Saint Augustine and Robert Grosseteste. From the beginning his philosophy was religious in character, and it was fed by a sense of the spiritual sterility of skepticism. As a theologian he sought inspiration in the Scriptures and the Fathers rather than in the speculations of medieval Scholasticism, and he fulfilled his doctoral obligations at Oxford by an unprecedented, if unoriginal, series of lectures conmmenting on the entire Bible. His growing repugnance for the religious institutions of his time led to his gradual elaboration, on the basis of his philosophy, of a concept of the Church which distinguished its eternal, ideal reality from the visible, “material” Church, and denied to the latter any authority that did not derive from the former. His idea that the clergy, if not in a state of grace, could lawfully be deprived of their endowments by the civil power, its own authority dependent on being in a state of grace (De Civili Dominio, 1375-60), was condemned in 1377 by Pope Gregory XI. In his De Ecclesia, De Veritate Sacrae Scripturae, and De Potestate Papae (1377-8), Wycliffe maintained that the Bible, as the eternal “exemplar” of the Christian religion, was the sole criterion of doctrine, to which no ecclesiastical authority might lawfully add, and that the papal authority was ill-founded in Scripture. In the later De Apostasia he denied, in violent terms, that the religious (monastic) life had any foundation in Scripture, and he appealed to the government to reform the whole order of the Church in England. At the same time in De Eucharistia he attacked the doctrine of transubstantiation as philosophically unsound and as encouraging a superstitious attitude to the Eucharist. Wycliffe’s eucharistic doctrine was that the bread remained, and that Jesus was truly present in the bread, though in a spiritual and not a material manner. These published doctrines gradually lost him substantial support in Oxford and reduced his following to a small but loyal group of sholars, along with a number of friends at court (he was protected from ecclesiastical censure three times in his later years by Gaunt and by the Black Prince’s widow). His eucharistic doctrine was condemned by the Univerity in 1381, and Wycliffe’s public refusal to comply in his Confessio created a scandal. The Peasants’ Revolt, popularly though erroneously attributed to his teaching – particularly his teaching on authority and grace – magnified the scandal, and a wide range of his teachings and followers (though not Wycliffe himself) were condemned by Archbishop William Courtenay at the Blackfriars Council in 1382. Wycliffe retired to Lutterworth, where he revised his polemics and produced a series of pamphlets attacking his enemies. After his death from a stroke on December 31, 1384, the continued activity of his disciples, who as they gathered strength among the less educated became known as Lollards, led to further condemnations of Wycliffe’s doctrines in 1388, 1397, and finally at the Council of Constance in 1415. In 1428 Wycliffe’s remains were removed from consecrated ground and burned, and the ashes were cast into the River Swift. Wyliffe’s philosophical influence at Oxford was considerable for at least a generation, though his later influence in England as a whole is less clear. However, his philosophical and theological writings exercised an influence on Czech scholars, especially Jan (or John) Hus, the Bohemian priest and preacher in Prague who was condemned as a heretic by the same Council of Constance as condemned Wycliffe. (Hus was convicted and burned for his heresy.) Many of Wycliffe’s writings survive only in Czech manuscripts. Outside the field of philosophy Wycliffe’s ideas were not original and can be compared with similar views of contemporary European reformers. His importance lies in his role in propagating his ideas. Wycliffe was an energetic preacher in Latin and in English, as his surviving sermons show. Furthermore, Wycliffe proposed the creation of a new order of Poor Preachers who would preach to the people from an English Bible. The first English versions of the entire Bible are the two associated with Wycliffe’s work, made by translating the Latin Vulgate between 1380 and 1397. It is unknown what part of the work of translation was done by Wycliffe himself, but Wycliffe certainly inspired the project, including the making of the second version after his death in 1384. Both versions were made by scholars who were his immediate disciples: Nicholas Hereford, largely responsible for the first version; and John Purvey, Wycliffe’s secretary, for the second version, completed in 1397. The modern-day Wycliffe Bible Translators, named in his honor, are committed to translating the Bible into all languages spoken around the world. Wycliffe is commemorated on December 31 in the Calendars of the Church of England, the Scottish Episcopal Church, and the (Anglican) Church in Wales; and in that of The Episcopal Church on October 30. O Lord, God of truth, whose Word is a lantern to our feet and a light upon our path: We give you thanks for your servant John Wycliffe, and those who, following in his steps, have labored to render the Holy Scriptures in the language of the people; and we pray that your Holy Spirit may overshadow us as we read the written Word, and that Christ, the living Word, may transform us according to your righteous will; through Jesus Christ our Lord, who lives and reigns with you and the Holy Spirit, one God, now and for ever. Amen. The image of Wycliffe is taken from the website of St Mary’s Church in Lutterworth and is of a late eighteenth century portrait of Wycliffe that hangs in the church. The Collect is taken from James Kiefer‘s hagiographical website. Born in London of a wealthy Norman family, Thomas was educated at Merton Abbey and at Paris. He was a financial clerk for a while and then joined the curia of Theobald, Archbishop of Canterbury, notable for the quality of its personnel and the skill of their legal expertise. He was sent to study law at Bologna and Auxerre; after being ordained deacon, he became archdeacon of Canterbury in 1154. In this position he was notably successful and was used by Theobald as a negotiator with the Crown. When Henry II succeeded to the throne of England in 1154, he chose Thomas, at Theobald’s suggestion, as Chancellor of England in 1155. Thomas’ close friendship with the young king, his employment on embassies and on military expeditions in which he actually led his troops in battle, apparently presaged a brilliant future in the political sphere. His personal efficiency, lavish entertainment and support for the king’s interests – even, on occasion, against those of the Church – made him a quite outstanding royal official. In 1162, Henry, expecting the same relationship to continue, obtained his election as Archbishop of Canterbury. But from this time Thomas deliberately adopted an austere way of life and immediately, to the king’s annoyance, resigned the chancellorship. However, the hairshirt, discipline, vigils, and maundies which he adopted did not end his previous determination. In character he was sensitive and intransigent, ready in speech and thorough in action. 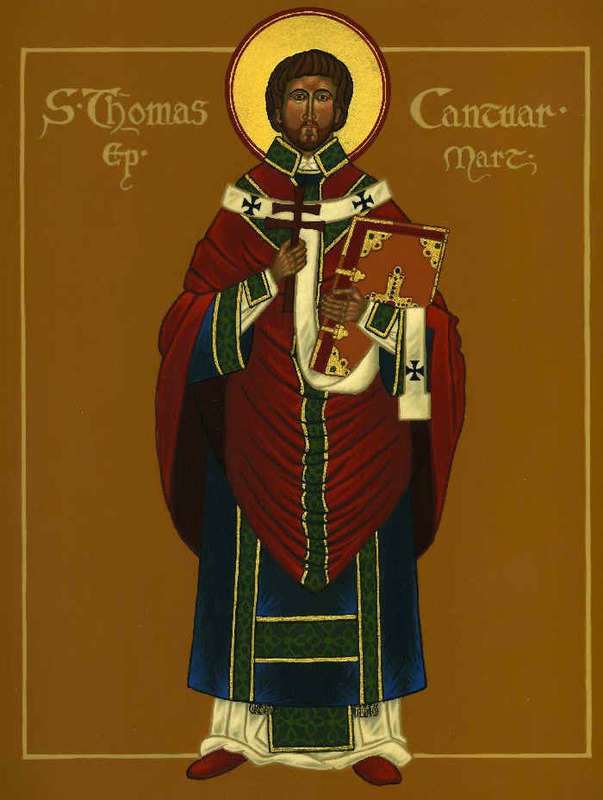 Now that he was archbishop, through no choice of his own, Thomas was determined to carry through, at whatever cost, what he saw as the proper duties of his state. These included the paternal care of the soul of the king, tactlessly presented by his friend of yesterday in a way which caused considerable annoyance. 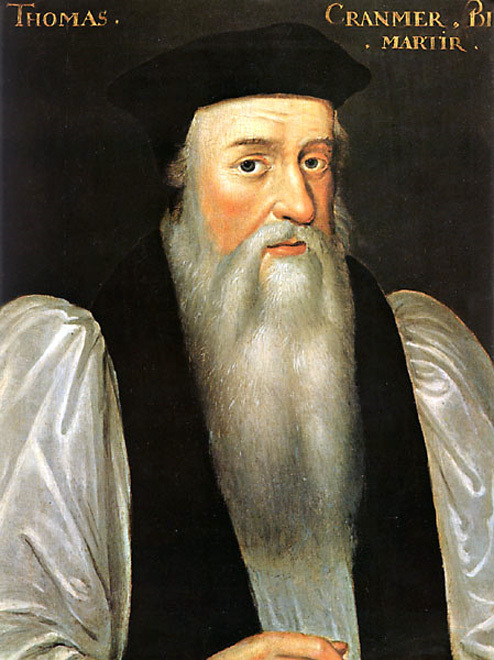 Thomas also opposed Henry in matters of taxation, on the claims of secular courts to punish ecclesiastics for offences already dealt with by church courts, and most important, on freedom to appeal to Rome. A long and bitter struggle ensued, and neither king nor archbishop would give way. At a council in Northampton Thomas, nearly alone, withstood royal claims of money owing the king from the days of Becket’s chancellorship and appealed to the pope. He then escaped to France. His exile lasted over six years, during which time he lived first in the Cistercian abbey of Pontigny and later at Sens. Both sides appealed to Pope Alexander III, who tried hard to find an acceptable solution. But the dispute grew in bitterness. Henry was bent on Becket’s ruin, while the archbishop used ecclesiastical censures against the king’s supporters among the higher clergy and even attempted to obtain an interdict of England. Thomas came to believe that deeper issues of principle were at stake in the dispute: the claims of Church and State, ultimately of God and Caesar. Although peace was eventually patched up in 1170 and Thomas returned to his diocese, the reconciliation was superficial. In defiance of the rights of Canterbury, Prince Henry had been crowned, and Becket answered by excommunicating the bishops most closely concerned. In a rage Henry asked his courtiers who would rid him of “this turbulent priest”. Four barons took the king at his word. After an altercation with Becket, they murdered him in his own cathedral. Although he had not always lived like a saint, he died like one, commending his cause to God and his saints, accepting death “for the name of Jesus and for the Church”. The news of his death shocked Christendom. Miracles were soon reported at his tomb, his faults were forgotten, and he was hailed as a martyr for the cause of Christ and the liberty of the Church. He was canonized in 1173, and his relics were translated in 1220. Representations of his martyrdom rapidly appeared all over Europe and beyond: early examples survive not only from France and Germany, but also from Iceland, Sicily, and even Armenia. At Canterbury Thomas more or less replaced the following of earlier local saints by the popularity of the pilgrimage, which soon became one of the most important in Europe. The Pilgrims’ Way, from London or Winchester to Canterbury, can still be traced. The stained glass windows that depict it at Canterbury are a rich source for many details of medieval life, and Chaucer immortalized its practice and its personnel in the Canterbury Tales. The great 16th century Catholic humanist Erasmus later attacked several elements of the cult and Henry VIII destroyed the shrine, ordering all mention of his name in liturgical books to be erased. 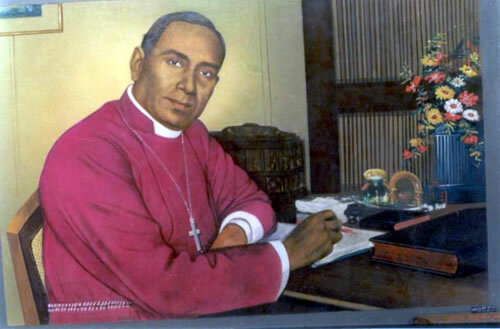 In recent years his commemoration has been restored to the sanctoral calendars of Anglican Churches. The icon supra is taken from the Sacra Domus Nazarena weblog. 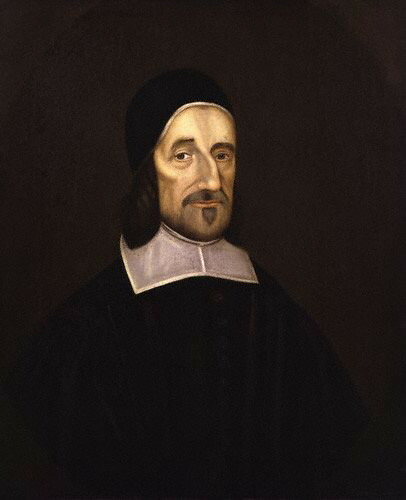 Born in 1615 at Rowton, Shropshire, Richard Baxter was largely self-educated. He studied first at the free school of Wroxeter, next under the nominal tutelage of Richard Wickstead, Chaplain at Ludlow Castle, and finally in 1633 under the patronage of Sir Henry Herbert, Master of the Revels. In disgust at the frivolity of the Court of King Charles the First he returned home to study divinity, particularly the medieval Scholastic theologians. In 1634 he came into intimate contact with two devout nonconformist divines, who awakened his sympathies for the positive elements in dissent. 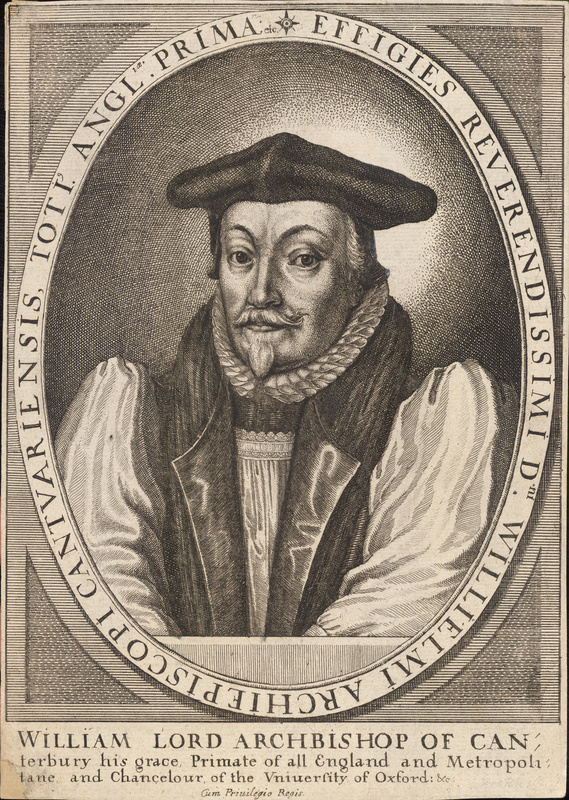 In 1638 he was ordained by John Thornborough, Bishop of Worcester, and in 1639 nominated assistant minister at Bridgnorth, where he remained for two years, increasing his knowledge of the issues between nonconformity and the Church of England. After the promulgation of the Et Cetera Oath (an oath of conformity henceforth to the polity of the Church of England, “by archbishops, bishops, deans, archdeacons, et cetera, as it stands now established”) in 1640, he rejected belief in episcopacy (the ministry of bishops) in the form extant in England at the time. In 1641 he became curate of the incumbent of Kidderminster (meaning that he became assistant priest to the rector or pastor there), where among a population of hand-loom workers he continued to minister with remarkable success until 1660. So far as possible he ignored the differences between presbyterians, episcopalians, and congregationalists, and secured cooperation among the local ministers in common pastoral work. In the early part of the Civil War he temporarily joined the Parliamentary Army as a chaplain. A champion of moderation, he was opposed to the Solemn League and Covenant of 1643 (the agreement which bound together the Churches of England and Scotland and eliminated episcopacy) and also disliked Oliver Cromwell’s religious views. After the Battle of Naseby (June 14, 1645) he became chaplain to Colonel Edward Whalley’s regiment, seeking to counteract the sectaries and to curb republican tendencies. On leaving the army in 1647 he retired for a time to Rous Lench, where he wrote his devotional classic, The Saints’ Everlasting Rest (1650). In 1660 he played a prominent part in the recall of King Charles the Second to England and was appointed a chaplain to the King, but his dissatisfaction with episcopacy led him to decline Charles’ offer of the bishopric of Hereford. He took a prominent part at the Savoy Conference (1661), at which English bishops and Presbyterian divines gathered for review and revision of the Book of Common Prayer. Baxter prepared his “Reformed Liturgy” for the conference, and he presented there his “Exceptions” to the Book of Common Prayer. Because he would not take an oath to conform to the new Act of Uniformity in religion, Baxter, along with several hundred other nonconforming ministers, was removed from his living (pastorate) in 1662. Between 1662 and 1687 the nonconforming ministers endured legal persecution and were not permitted to hold any ecclesiastical office or living. Baxter died on December 8, 1691. Baxter left nearly 200 writings, which breathe a spirit of deep unaffected piety and reflect his love of moderation. The Reformed Pastor (1656) illustrates the great care he took in his pastoral administration. He also wrote several hymns, among them “Ye holy angels bright” and “He wants not friends that hath Thy love”. Heavenly Father, Shepherd of your people, we thank you for your servant Richard Baxter, who was faithful in the care and nurture of your flock; and we pray that, following his example and the teaching of his holy life, we may by your grace enter that everlasting rest which you have prepared for all those who set their hope on Jesus Christ; who lives and reigns with you and the Holy Spirit, one God, for ever and ever. Amen. The image of Baxter is after a painting by Robert White (1670). Ambrose was born at Trier, the son of the Praetorian Prefect of Gaul. Following education at Rome and a traditional administrative career, he practiced in the lawcourts and in due course was appointed governor of Aemilia-Liguria, with his seat at Milan. On the death in 373 or 374 of Auxentius, the Arian bishop of Milan, Ambrose became involved in the election of his successor as a mediator between the battling factions of Arians and catholic (orthodox) Christians. The election was an important one in the struggle between the adherents of Nicene orthodoxy and the adherents of the Arian heresy because of the significance of the provincial capital city in northern Italy. Ambrose exhorted the nearly riotous mob to keep the peace and to obey the law. The Milanese laity of both sides suddenly raised the cry, “Ambrose shall be our bishop!” Though brought up in a Christian family, Ambrose was not yet baptized, but was still a catechumen. After initial resistance, he accepted his popular election to the episcopate of the city, was baptized and ordained bishop on December 7. He devoted himself to the study of theology, perhaps under the guidance of Simplicianus, who later succeeded Ambrose as bishop of Milan. Ambrose rapidly won renown as a defender of Nicene orthodoxy against Arianism and as a great and respected churchman. He wrote straightforward, practical discourses to catechize his people in such matters of doctrine as baptism, the Trinity, the eucharist, and the Person of Christ. About baptism, Ambrose wrote: “After the font (of baptism), the Holy Spirit is poured on you, ‘the spirit of wisdom and understanding, the spirit of counsel and strength, the spirit of knowledge and godliness, and the spirit of holy fear'” (De Sacramentis 3.8). Apart from De Sacramentis, his most notable work is De Officiis Ministrorum, a treatise on Christian ethics, based on Cicero, with special reference to the clergy. Knowledge of Greek enabled him to introduce much Eastern theology into the West. He also wrote on ascetical subjects and did much to encourage monasticism and the veneration of martyrs in northern Italy. His persuasive preaching was an important factor in the conversion of Augustine of Hippo. In his dealings with the Roman emperors of his day, Ambrose asserted a remarkable degree of authority. He persuaded Gratian to refuse a hearing to those who objected to the removal of the Altar of Victory from the Senate House at Rome and threatened ecclesiastical sanctions against Valentinian the Second if he restored it. He excommunicated Theodosius for a massacre of several thousand citizens of Salonika (Thessalonika) in 390, forcing the emperor to do public penance for the slaughter. With equal strength he asserted the independence of the Church from imperial control, refusing to cede a basilica to Valentinian’s Arian protégés and protesting against the action of the Gallic bishops in involving Maximus in the execution of Priscillian as a heretic in the year 386. Ambrose was also a skilled hymnodist, introducing antiphonal chanting to enrich the liturgy of the Church of Milan. It was through his influence that hymns became an integral part of the liturgy of the Western Church. Those hymns universally attributed to him include Veni redemptor gentium (“Come, thou redeemer of the earth”, “Savior of the nations, come”), the hymn for the first vespers of the Nativity (on Christmas Eve) in the Sarum Use, as well as three other hymns for the daily office. Hymns also attributed to him by later Benedictine editors include Splendor paternae gloriae (“O splendor of God’s glory bright”), Aeterna Christi munera (“The eternal gifts of Christ the King”), and O lux beata Trinitas (“O Trinity of blessed light”). O God, you gave your servant Ambrose grace eloquently to proclaim your righteousness in the great congregation, and fearlessly to bear reproach for the honor of your Name: Mercifully grant to all bishops and pastors such excellence in preaching and faithfulness in ministering your Word, that your people may be partakers with them of the glory that shall be revealed; through Jesus Christ our Lord, who lives and reigns with you and the Holy Spirit, one God, now and for ever. Amen. The propers for the commemoration of Ambrose, Bishop of Milan, are published on the Lectionary page website. 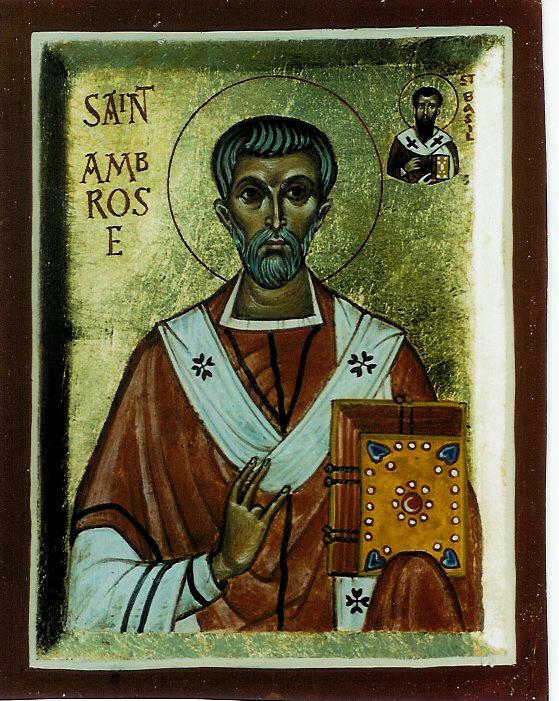 The icon of Saint Ambrose of Milan is from Aidan Hart’s gallery of Western Orthodox saints and is reproduced here with his generous permission.